Our Favorite Beer Can Chicken. Let me tell you about one of the best things I’ve ever done. And no, it’s not this chicken. how does this photo below make you feel? I mean, let’s be real. Can you actually take this seriously today? Because the ACTUAL best thing I’ve ever done is teach Eddie how to roast a chicken. In fact, he asked me – which certainly means he must have been abducted by aliens that day. And I taught him – which miraculously did not come complete with divorce papers or even an argument – and now… now? He kind of makes them better than I do. Because I can sometimes be rushed and am all oh just let me add olive oil, salt and pepper while he takes his serious time and adds spices and flavors and twines the legs and what not. Like he does it RIGHT. Like he does it like he hasn’t been doing it once a week for four years. Because it’s pretty much been that way for me. Regardless, it’s still one of our favorite things ever. 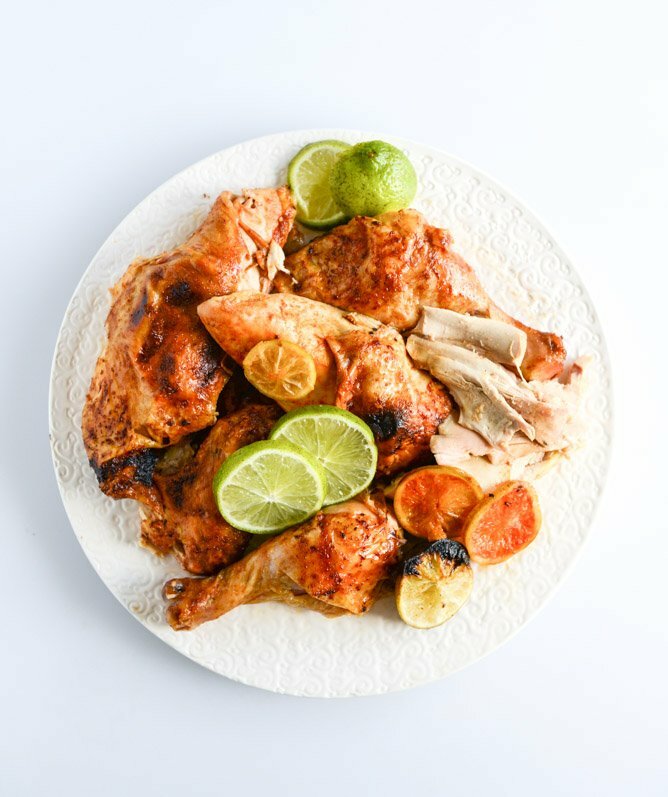 Even if we’re sick of “regular” roasted chicken – I still make one each week because it never fails that I will use it in SOMETHING. Soups, enchiladas, tacos – all the things. This version is a… “special” version, if you will. 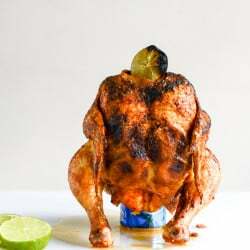 Special as in I will usually make a beer can chicken if we just want to eat roasted chicken for dinner with some good old sides. Be boring but not so boring. And if I’m being real, the true reason we enjoy beer can chicken is because ALL of the skin gets crispy and then we don’t fight over it. That’s the worst part about teaching Eddie how to roast a chicken. Now he steals all the skin. So. What kind of beer did I use? Bud light. Is that trashy? Do you think I’m trashy(er) now? It’s what I had and almost always the beer that I will use in beer can chicken. My other available option was a vanilla porter which I didn’t think would float any boats. Just no. The other reason I like to use Bud light is because it comes in skinny TALL cans! It means the chicken sits up easier, doesn’t fall down half way through, and in my own secret brain I like to think that it flavors the chicken more but I’m sure that’s debatable and you will tell me that I’m wrong. DON’T RUIN IT FOR ME. But. Do not fear. You can use whatever beer you like that comes in a can. Whatever you like to drink – use it. What else. This is obviously the oven roasted version. We like to grill this too but sometimes it’s April and still 35 degrees out. 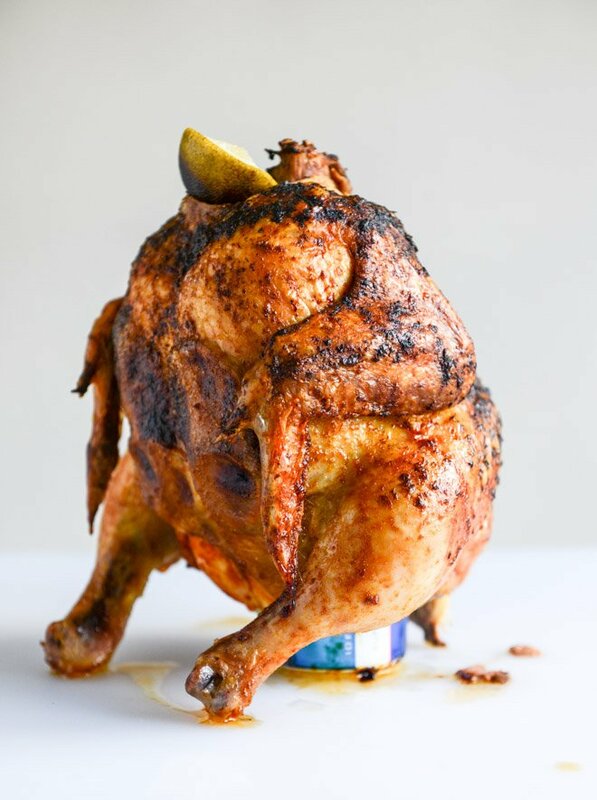 Some people freak over beer can chicken, saying it’s not safe because of plastic or dyes in the can. We’ve eaten beer can chicken for years and we’re still kickin’. Do your own research and decide if you’re game. It’s not something we do every week when we roast, but it’s a fun switch. Cliché moderation, you know? We prefer limes over lemons. There is a time and place for lemons and this is not it, especially since beer is involved. Give me a lime all the time. I not only stuff butter and spices under the skin, but also lime slices. The lime, the beer, the makeshift little BBQ spice rub – GAH. So freaking good. I don’t even want to say it, but it’s ridiculously juicy. Preheat the oven to 425 degrees F. Place a baking dish, roasting pan or dutch oven on a baking sheet. Open the can of beer and take a few sips and/or pour about 1/4 of it into the dish or pan. Set the can in the center of the dish. Remove the giblets and any other parts of the chicken and discard or set aside for another use. If desired, wash the chicken but either way – pat it TOTALLY dry with paper towels. You don’t want one speck of liquid. In a small bowl, stir together the sugar, salt, pepper, paprika, garlic powder, onion powder and chili powder. In another bowl, add the softened butter. Add a few pinches (about 1/3 of the mix) of the spice mix to the butter and stir together until combined and smooth. Gently lift the skin of the chicken and rub the butter all over the breasts (UNDER the skin) and the thighs, if you can get to them. You only have to add a thin layer because much of the butter will run out of the chicken as it cooks. Push it up underneath the skin as far as it can go. 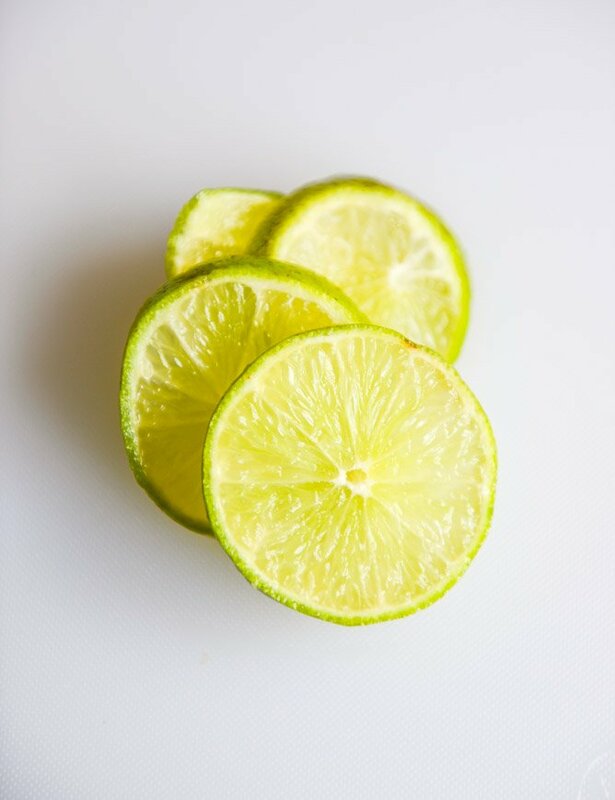 Slice one of the limes into 1/8-inch slices and slide them up underneath the skin – as many as you can fit in one layer. Gently sit the chicken on top of the can of beer which is in the dish (OMG, so many things), the beer can going into the cavity of the chicken. Or you might have one of those fancy contraptions that makes beer can chicken easier. Rub the outsides with olive oil – don’t miss a spot! And rub the remaining spice rub over top. Slice the other lime in half and shove it face down in the top cavity of the chicken (where the neck would be). Roast the chicken for 1 hour and 15 minutes. When finished, carefully remove the pans from the oven and let the chicken rest for about 20 minutes. I use kitchen tongs and my hands to gently remove the chicken from the can (it may take some wiggling) – discard the can and slice/serve the chicken as you wish. Just made this and the chicken was moist and crisp! However there was a distinct bitter taste on chicken pieces that had been touching the limes! It was pretty strong and unpleasant. Should the limes be peeled beforehand to avoid this? This chicken. Honest to Dog. 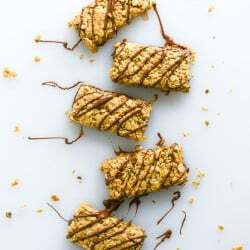 I have made this sooo many times (I have my own signature spice rub, but it’s pretty close to yours upon review:), and it’s always a crowd pleaser. However, I’ve always done it on the barbee. This evening the wind was not favourable to life outside, ha, but you provided that oven option and you’re now a hero. Really though. Apparently I am also, since now I have to make it again tomorrow – that good – but the credit is all yours! Thank you so much for sharing! Beer can chicken in the snooooow….score. Friends. Bribe the chicken overnight – Oil, Water, Soy Sauce, Sugar and Salt. You’ll thank me. I’m gonna try the rub and the rest of what this suggests except for the treatments that the brining overnight will cover. My chickens never take bribes, do you have any other ideas? Plus, they keep moving about and running away whenever I squirt anything on them, be it marinade or otherwise. Looking for a friend. Brine. Haha Brine the chicken. Maybe a bribe would help you when your chicken runs away after you squirt on it.